WHOA! OMG! QUEEN MATTRESS ! ONLY $215.79 SHIPPED! USE CODE: 96FU7R5J at check out! 【Help Solve Your Sleep Problems】- Inofia medium-firm 9 inches spring queen mattress is made of 5 zoned pocket springs, keep your body properly aligned, fully supported and pressure relief at comfortable cool temperature, helps those with back pain, tossing & turning for good night sleep. 【Ergonomic Design and Maximum Support】- The spring queen size mattress use Five zone pocketed springs, which gives you body comfort support, On top of these are multilayers comfort foam that keep the springs away from you and making the bed feel so comfortable. High quality carbon pocket spring, good support performance provide the targeted, tailored support for your skeletal system. Tempered by heat treatment for the rust&deformation prevention for great durability. 【Hypo-allergenic Treatment】- Professionally hypo-allergenic treatment reduces moisture and dust-mite allergen inside the foam queen mattress for a healthier sleep. The medium firm double mattress surface is hand-stitched&quilted by skilled craftsman for the superior and elegant look. 【Super Comfort】- Perfectly euro-top 3D knitted fabric makes for the breathable and smooth comfort surface. Revolutionary high-density foam brings you conforming comfort. Air-cool wave of cover promotes the airflow inside mattress, giving mental and physical being relies with no suffering back pain next day. 【10-Year Long Warranty& 100 Nights Trial】- We offer a 10 Year Guarantee to make you feel confident of our quality; By the way, you can enjoy 100 nights trail to confirm our quality and durability . ✔Top layer of memory foam reduces pressure points, disperses body heat and creates the cool surface. 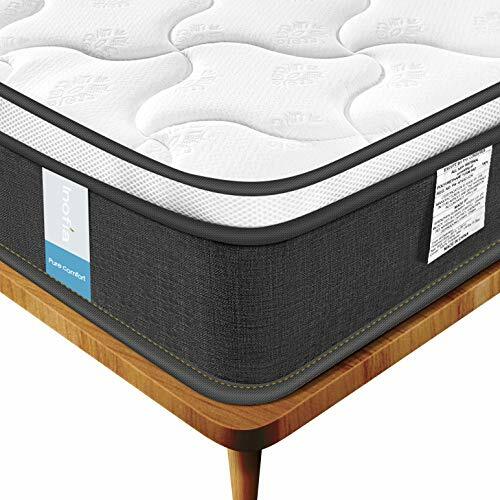 ✔High Density Base Foam provides great comfort and support for an undisturbed sleep.